Your entire fleet, in the palm of your hand. 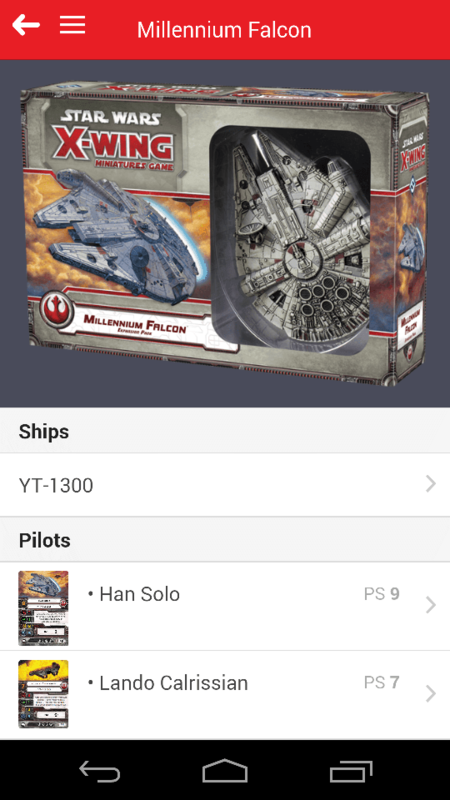 X-Wing Companion lets you browse every pilot, ship, upgrade and expansion pack available. View every card in full detail! 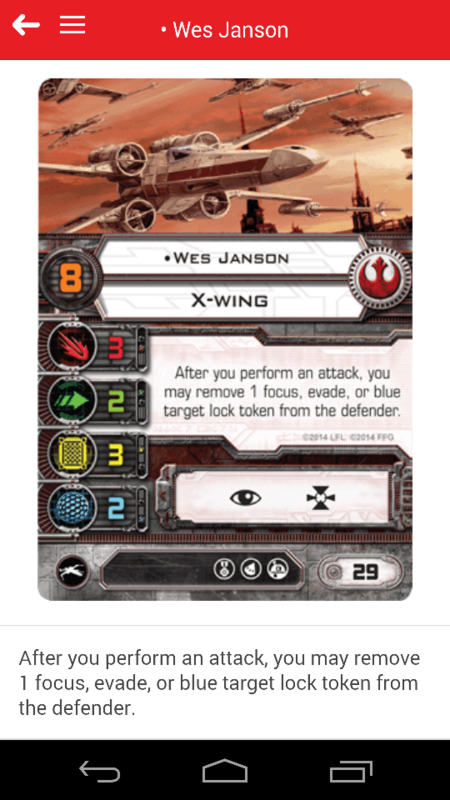 Card images are front and center in X-Wing Companion. 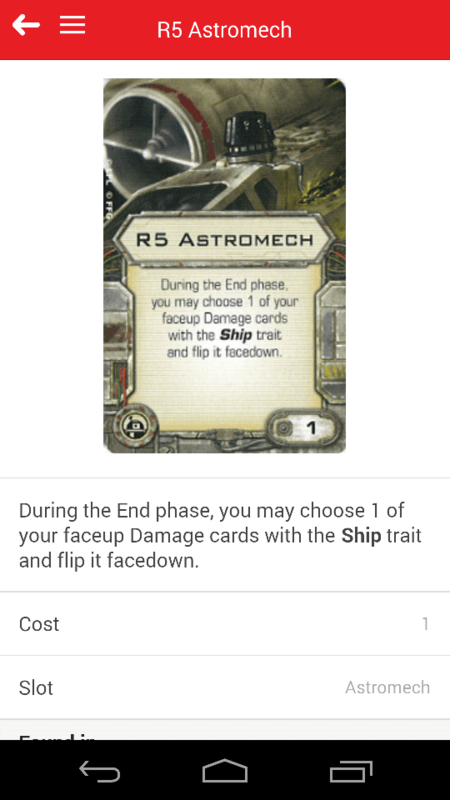 X-Wing Companion includes all known released and unreleased content. 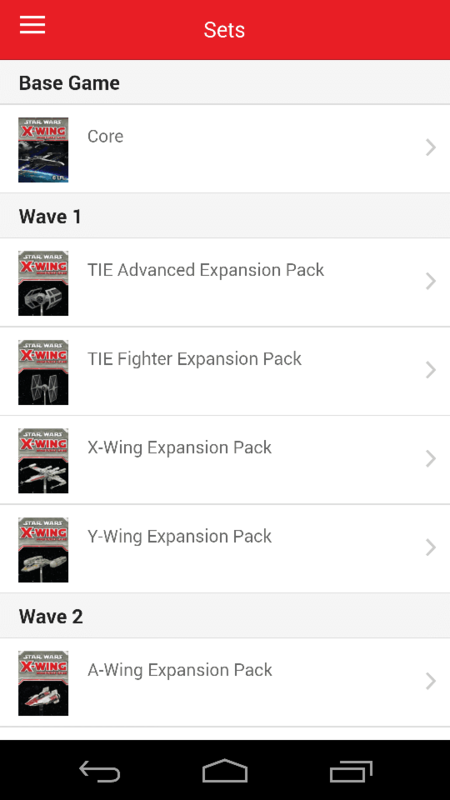 XWC has all known content for the upcoming TIE Defender, TIE Phantom, Z-95 Headhunter and E-Wing expansion packs! X-Wing Companion does not need a internet connection. You can use it wherever you want, whenever you want. Don't know what to buy to get a copy of Advanced Sensors for your B-Wings? XWC will tell you which expansion packs include the card you want. Is your opponent using a card you don't know? Forgot Howlrunner's special ability? 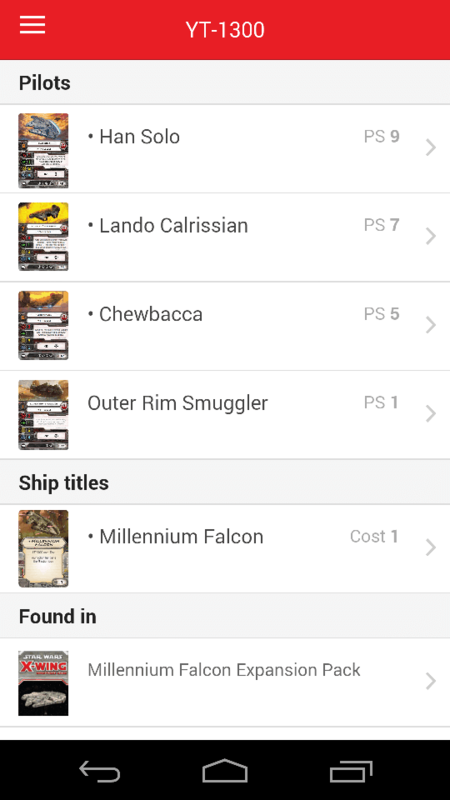 Fear not, just use X-Wing Companion's fast search feature! The fastest way to find any card! 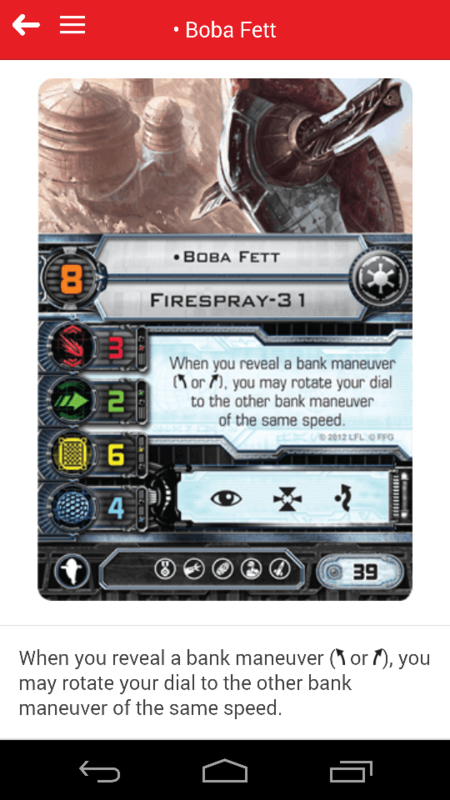 A small selection of features that are planned for X-Wing Companion. 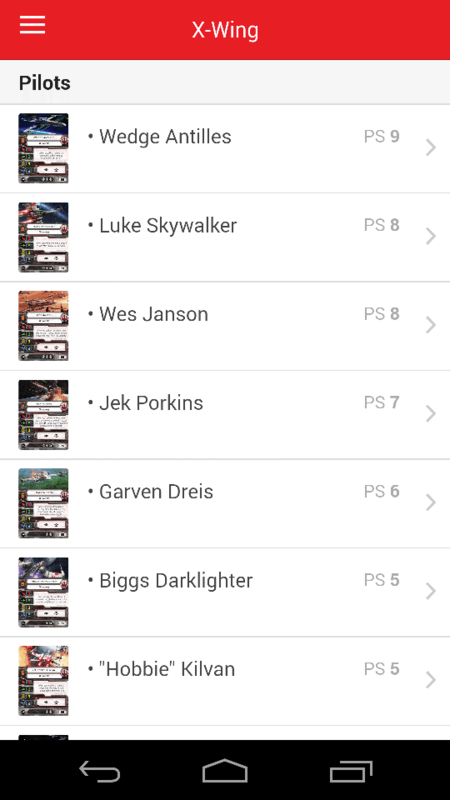 Use XWC to find the cards you like, then use them to create your squads. Define the squad point total and keep refining until you've hit that perfect combination of pilots and upgrades. Keep track of the sets you own. Using the Squad Builder you can create a squad based on the cards you own, or create a squad with all content in the game. Compatibility with more devices, including iPhone and iPad. 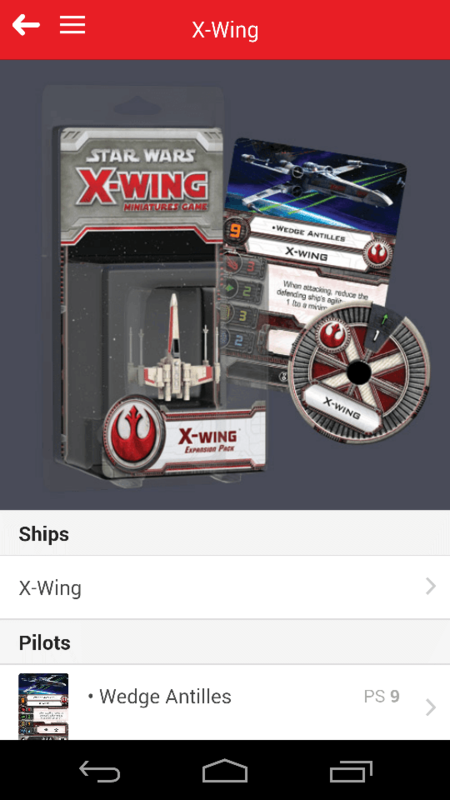 X-Wing: The Miniatures Game is a trademark of Fantasy Flight Games. X-Wing Companion is the work of a fan, and is not endorsed by Fantasy Flight Games, Lucasfilm Ltd. or Twentieth Century Fox and is intended for entertainment and information purposes only. Star Wars, the Star Wars logo, all names and pictures of Star Wars characters, vehicles and any other Star Wars related items are registered trademarks and/or copyrights of Lucasfilm Ltd., or their respective trademark and copyright holders.